AFTER four knee operations, a bulging disk and 30 years of excruciating back pain, most 58-year-olds would choose the bar stool over the bike saddle. 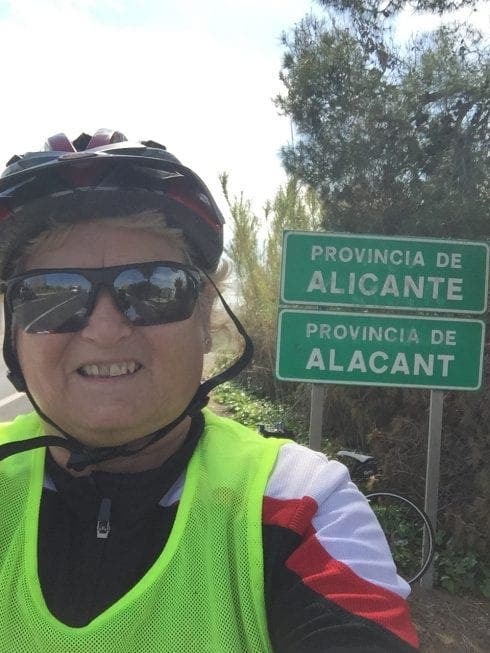 But British expat Carol Webb has just completed a 320-kilometre journey from Miami Platja, Tarragona, down to Calpe on the Costa Blanca after losing two friends to cancer. 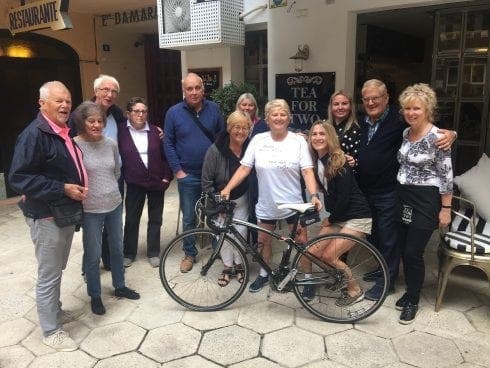 Carol, originally from Waltham Abbey, celebrated her finish at the Tea for Two tea house last Saturday with 11 close friends, raising €1,200 for the cancer department at Hospital Universitari Sant Joan de Reus along the way. “My back was hurting all the time, but you tell yourself there’s probably 100 people who have died of cancer today, and you keep on going,” Carol told the Olive Press. 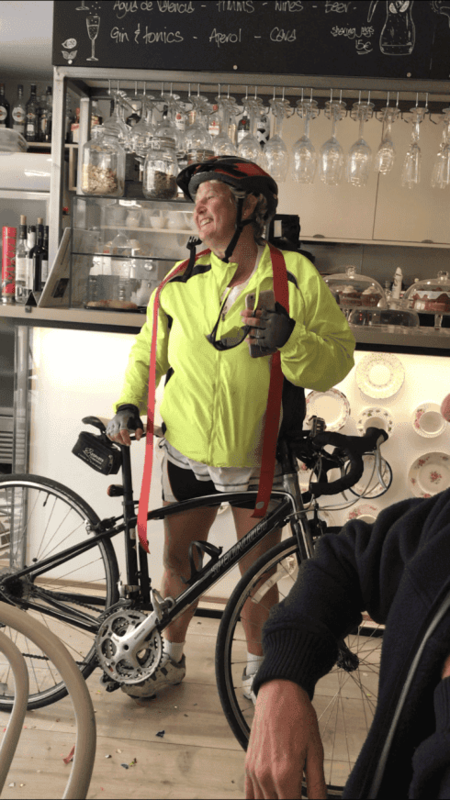 Carol’s journey began the previous Sunday, March 31, from Gino’s Miami Platja bar, and she rode around 60km each day, finishing on Saturday, April 6. She was closely followed in a car by mum Ruby, neighbour Pat Allworthy, and friend and sports massage therapist Julie Robinson, 61, who gave regular massages to help Carol with her back. Carol said Harley Street doctors had told her to get her vertebrae fused some 30 years ago, but she refused as the operation would have left her bedridden for six months and with ‘less flexibility’. “Julie waited with a blanket on the roadside for me every day, and at one point an ambulance stopped to ask if she needed help!” Carol said. Carol said she felt she had to act after her circle of friends lost two members to cancer in the past year. “If Carol wants to do something, she will,” Julie told the Olive Press, adding that seven years ago Carol ran 26 kilometres to raise money for the British Heart Foundation following the death of her father. She said Carol gets her adventurous spirit from mum Ruby, who only gave up quad biking aged 79 after rolling one on a mountain side. She added she had now plans to cycle from London to Spain, and was already planning an evening hike up Calpe’s Penyal d’Ifach.